I had the privilege of creating the first ever official map of the whole world, as well as maps of cities and details of regions never before seen on maps, or even described in the books. In the run up to Season 3 of Game of Thrones I’ll be posting low res images from the maps I created, along with some discussion of the work behind creating the maps for a project of this size. To get hold of the high resolution versions, you can pick up the full set of posters. Today I’m starting off with everything – the entirety of the Known World. Westeros is a known quantity and has been detailed in many official and fan made maps over the years. But everything east of Quarth was uncharted territory. Partly it still is – George RR Martin was quite specific that these maps would be an interpretation of the current state of knowledge of the world rather than a faithful satellite imaging. But with names like Cities of the Bloodless Men, and Cannibal Sands, we’re given a sense of an East that is distant and exotic beyond imagining. The world map was the first order of business. With the world map in place, and all the locations signed off, it was much easier to dig in and create the detailed maps illustrating the individual regions. This map has everything – bleeding seas, steaming jungle, towering mountain ranges and the weird shadows of Asshai. We’ll see more of those as we travel to the detail maps over the coming month. Feel free to ask questions – I’ll answer the ones I can! Thanks – that means a lot. >>I had the privilege of creating the first ever official map of the whole world, as well as maps of cities and details of regions never before seen on maps, or even described in the books. So what was that process like, to map stuff not even in the books (yet)? How did you collaborate with Martin to make that happen? Maps are about accuracy, and in this case I had an excellent base to work from. The line sketches handed over were very precise and then it was a matter of drafts, followed by comments and then re-drafts. We worked over details like the exact colour of ghost grass, the nature of the Shadow and the appropriate colour of the exotic colour of the jungle in Ulthos, but George had a very good idea of his vision for the far east. That kind of clear picture is great to work from. 1) HBO previously revealed a map of Essos on their website for the TV show that is completely different to the one in the poster collection. GRRM said he’d thoroughly reworked his ideas for the shape of Essos at some point. Was that a process he’d already completed by the time you got involved, or did you get to see an evolution of his ideas for the shape of the continent? 2) Was there any discussion about showing more of the southern continents (Sothoryos and the new continent of Ulthos) or going further and showing all of Essos? Or did GRRM rule that out early on? 3) Do you know if the guy who created the Dothraki language for the TV show as also responsible for all the Dothraki location and ruin names? 4) Was there any discussion of including more maps, like say of Winterfell or Meereen? Or was the decision of what maps to include locked from the start? 1) The shape you see in this map is the shape handed over to me in the sketches from George. I have to say the original line work was excellent, and gave me a great base to work from. Any re-drawing of the continent was complete before I was involved. 2) The brief was very specific on the maps involved and their extent. There was a little bit of editing around the edges as we figured out the exact layout of each map and how that would work wit the pencil sketches, but what you see here is more or less what I had turned over to me at the start. 3) I don’t know who was involved in the Dothraki names I’m afraid. 4) The map list was pretty much final when it came to me. Wonderful job!!! I especially love the World Map. What did you think about the decision to have pull-out maps with so many creases, as opposed to some type of book that showed the maps without creases? Thanks! I knew from the start that this was going to be a folded map folio – even the very early product mockup images were in that direction. Personally I rather like it – I grew up with shelves of folded ordnance survey maps. To me a map without creases is just a little wrong, but then that’s me. Unfortunately these are the only ones that will appear on the internet. They’re © George RR Martin, and this resolution is the largest that will be permitted. To see the full size images, you’ll need to pick up the physical maps – I can guarantee the text is readable on those! The maps can be picked up at Amazon for $2 a map. Do you know if in the future, they will sell these maps in digital form?? As for me when reading (and re-reading) the books, it well make my life easyier looking at the maps. As far as I know, these will remain paper only. But definitely send comments to Random House to encourage them! Wow you’re amazing! I scrutinized all your ASOIAF maps and they look so beautiful! I was given to understand that no map went any farther east than Slaver’s Bay, looks like I was sadly misinformed, this is gorgeous work, truly!! And I’m so happy we got to see a bit of the Shadow Lands, I’ve always wondered what they were, what they looked like and most importantly, what this shadow might be. The last point remains unanswered though, but I hope the upcoming books will provide some details! Do these maps exist as rolled posters rather than folded in a book? And if not, do you know if they will? As far as I’m aware, this is the first official map of what lies beyond Slaver’s Bay. I always wanted to know myself, and it was great to be the one to illustrate it! As far as I know there is no place to get these maps as rolled posters rather than folded posters. If I hear of plans to release a rolled poster set I’ll definitely post about it and share it around. There’s definitely a lot of people asking for this! Wow, these are fantastic! Just wondering one thing: If the map were to go east of Westeros, would it circle back to Ulthos, or is there something in between? Thanks so much. There’s something in between – I think this is around a quarter of the total globe, but I could be wrong. As a GGRM devotée and cartophile, and art director for 30 plus years, my heart leapt with joy when I saw your rendering of Map of the Known World. As a boy, I used to await the National Geo’s with MAPS and spent time with those, giving the magazine but cursory attention. I also spent hours drawing “fake worlds” as my friends called them, often inventing languages & even alphabets to mark them. I swear, as a boy, I dreamt of a map which, in retrospect, looked a lot like Old Valyria (can’t get enough about all things Valyrian). So as you might imagine, I am enthralled by your work. And like many, I hunger to know more about the vast, “new” lands to the east of Qarth. How wonderful it is that the best maps can create as many mysteries as they resolve. Your artistry has captured both Mr. Martin’s mystery & magic. Bravo! I too love to draw fictional maps, with scales great and small. I’m even working on a map of Azeroth (World of Warcraft). Of course, Jon, I’d love to be able to reach the perfection that you are able to draw. I’m just learning about the map making process via computer but I must say yours look amazing! They capture all the detail envisioned by the author with a very distinct and antiquated feel. I am trying to develop a map for a game I have created but the map needs to be very detailed and have the same “feel” as the ones you designed for Game of Thrones. I am a little confused about the program(s) used to design such maps. Which program(s) would I need to be able to create similar maps in the same style and feel? Is Fantastic Maps a complete program(I basically want to know which map design programs you use to create such beautiful maps)? Any light shed over this matter would be great insight. Is Carcossa and Hali a G.R.R Martin easter egg? Is there a plan to release the entire globe at some point, or will it always remain a mystery? Also if it will eventually be released is there a timeline for it/does it line up with the release if the coming books? Absolutely amazing work! Im from Brazil and I just bought the poster collection, went on google looking for more info on the map and ended up finding your blog. I am a map drawing enthusiat myself and I found your tutorials and tips very useful. You are very talented and your work on The Lands of Ice and Fire is gorgeous and very rich in details, congratulations! Thanks! So glad you’re finding them useful! Hey Jon, I’m very curious as to what Asshai and that shadow lands are like as well as the dry deep. I was wondering if you could elaborate. Hey there. I don’t have a huge amount of information on those. The dry deep used to be an inland sea that evaporated I believe. Asshai remains shrouded in mystery – even to me. The Shadowlands are partly named as such because of the very tall mountains and deep ravines. However there’s clearly more to their threat than that, and the ghost grass does actually glow – so there are truly bizarre features that far east. Thanks. Mabey you could tell me what that ice fortress of badassery was in the latest episode? I’m afraid I have no insight on the Ice Fortress of Badassery from last night 🙂 I want to know too. It has to be close-ish to Crasters for them to get there without the child dying en route, but it’s hard to believe the rangers missed something like that so close. I had one more thing I wanted to ask you. Who are the faceless men? I really only have one question. If I’m in Lannisport and I buy a ship and sail due West, when and where will I end up? That way lies the deep ocean. No-one has crossed it and returned. But we do know the world is a globe, so eventually you would make it back to the far East. Beautiful work man! I really appreciate what you’ve done. I wanted a huge close up of the entire map but i know that must be really difficult to do. Still it’s fantastic we get this gigantic map with locations we had never seen before. Hi! The link for full resolution redirects to some posters on Amazon. I would like the digital format so I can keep it on my tablet and check it out while I’m reading the book when I’m commuting. Is it possible to get it? Thanks and congratulations on the work! Any chance versions of this map get sold as a large canvas print anytime soon? I’d love to put something like that on the wall like it was a map of the real world. there are sub par options available that don’t show the entire known world, aren’t accurate per your depiction, have “game of thrones” written on it, etc. I’d just as soon pay for an official version but want something a little nicer than a poster. thanks and nice work. Not that I know of I’m afraid. Mr Martin owns full rights, so certainly could produce a premium version like that. Unfortunately not something I can produce as the rights lie with him. The maps are, of course, absolutely beautiful and really help in understanding where the characters are going and why. Just one detail in the above post that’s incorrect: the name of the city is “Qarth” not “Quarth”. I hope the maps have it right, lol. 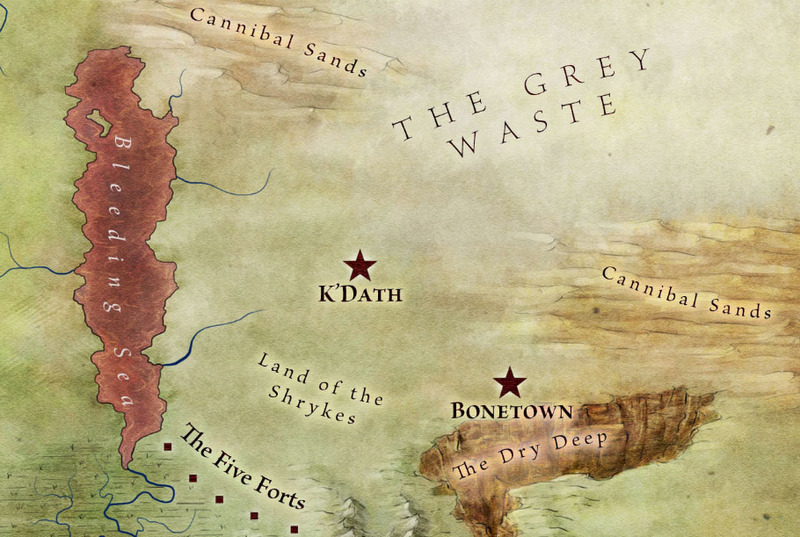 I want to know more about Ulthos, Sothoryos, the Jade Sea & carcosa. I hope he writes books on those places. Your work is awesome, I love doing maps for my self and I would like to know what program do you use to make something awesome like this. This was all done in Photoshop with a Wacom tablet. If you look through my tutorials you’ll find a lot of tips on how to use those (or gimp -free) to make maps like this. Great map. They should really sell it in a tube so that people could frame it without having any crease or mark. HBO sell their map like that, mas this map is so much better. I bought this map in a tube from Barnes and Noble 2 years ago. Very good quality except they must have made it an extra half inch too long because it doesn’t fit a 24 x 36 frame. Haven’t framed it up yet for this reason. Thank you for the great artistic contribution to the fandom and the world of fantasy literature as a whole! Can you also enlighten us whether this map will be available in a fabric/canvas form that can be framed or hung on the wall? Just in poster form I’m afraid! Do you happen to have any shapefiles or vectors for the updated map? I’m a cartographer and I wanted to do some spatial analysis (for kicks) on a few things. Not that I can provide I’m afraid! NDA’s are powerful things. Wonderful work indeed.Will we ever see a detailed World Map with the permanent ice above the Shivering Sea an the full extent of Sothoryos and Ulthos and the lands to the West?I know there is so much more as GRRM told me in 2013 when I met him at Supanova.He said there were far more lands to explore south ,est and east.There are so many other civilisations , lost and yet to find and many other great kingdoms who exist but have not been seen by Essos and Westeros communities.A dragon Terrax ,with Jaenara Belaerys flew down to Sothoryos for a long time (3 years !!!) and never reached the end of the landmass and she saw many strange people and places and things…. There’s definitely a lot more of the world than is seen here. I guess we’ll find out how much more of the world will be revealed as George and HBO explore more in print and on screen. Definitely intrigued to see more. Your work on these maps is breathtaking! Since it has been a year or two since this was last asked, are any of these maps available as rolled posters rather than folded? I know that many others, along with myself, would love to frame these in a pristine condition. Thank you for all of your hard work! That’s still in the hands of Random House and George I’m afraid! I’d love to see them as rolled posters. Has anyone else noticed that all the peninsulas and other land jutting off from Westeros on the east and west coasts all jut out about the same distance? As an example, the easternmost tip of Dorne extending into the Summer Sea has almost exactly the same longitude as the tips of the other strips of land such as the Fingers and the peninsulas around Blackwater Bay. The same goes for the western coastline. Westeros almost perfectly resembles a rectangle that has simply had some of the edges partially worn away. Hi John. 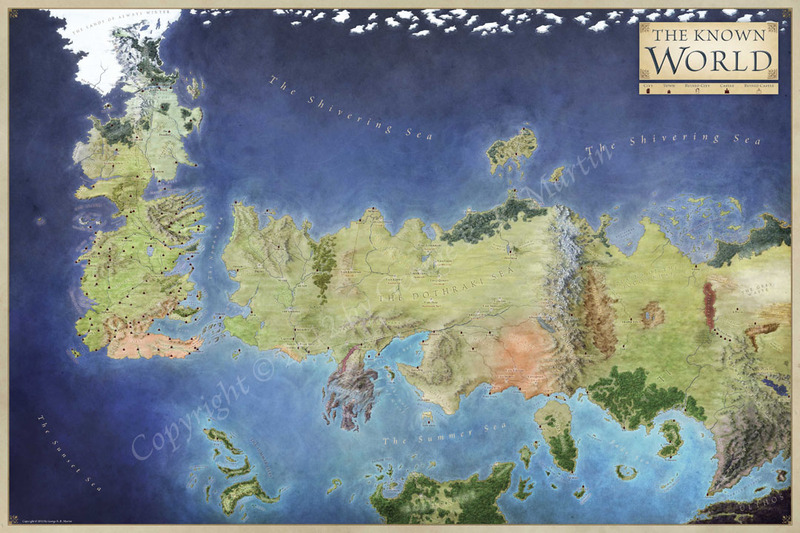 Is it possible to buy from you map “The Known World from Westeros to far Asshai” in high resolution format i would like to stamp it and put it on my wall.. (4m x 2m) or when can i get this official maps in high resolutions? I’m afraid this was done as a work for hire for GRRM, so I can’t sell the maps directly. Sorry!